Daikin’s Under Ceiling Cassette is a unique product – a 4 way blow system that can be installed under the ceiling in rooms that have solid ceilings or narrow voids that may prevent a traditional cassette being installed. 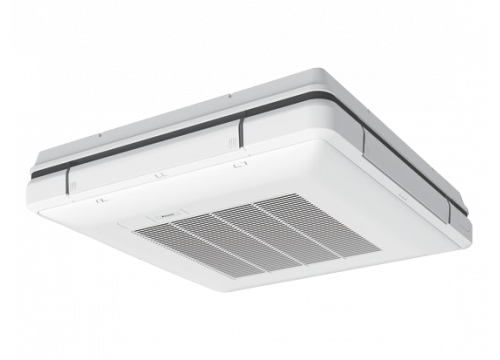 The Under Ceiling Cassette exceeds Energy Related Products Directive minimum efficiency standards for Seasonal Efficiency, combining industry leading efficiencies with smart looks and functionality to suit office and retail applications. The re-designed profile of the unit means it is less obtrusive when installed. Air discharge louvres close completely when the unit is not operating, adding to the aesthetic. Energy savings can be made using the remote controller which gives control over set-point ranges and day-to-day use of controls. This can give occupants some flexibility over room conditions without compromising energy usage. Energy efficiencies can be improved by utilising the selectable evaporating and condensing temperature option, making the Seasonal Smart Under Ceiling Cassette the ideal solution for energy conscious building managers.